明鏡止水's GuitarFreaks & DrumMania / ポップンリズミン jacket. 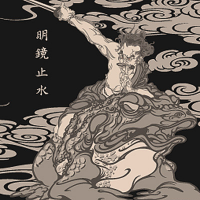 The ending part of 明鏡止水 is an arrangement of traditional Japanese folk song Sakura Sakura. A remix of 明鏡止水 by Sota Fujimori feat. Mutsuhiko Izumi, titled 明鏡止水 - Stop The Fire Mix, appears in GuitarFreaksXG2 & DrumManiaXG2 Groove to Live. 明鏡止水 marks the first collaboration between Asaki and Tomosuke Funaki in BEMANI. 明鏡止水 is one of the pop'n music 10 preview songs that can be found on pop'n music 9 CS. 明鏡止水 is one of three EXTRA STAGEs new to GUITARFREAKS 11thMIX & drummania 10thMIX, along with MODEL DD6 and Orbital Velocity. Earning at least 95% Perfects on MODEL DD6 will access 鬼姫 on ENCORE STAGE, up to the highest difficulty tier played on EXTRA STAGE. 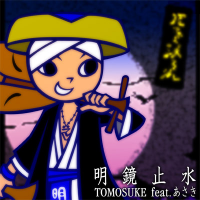 In the GuitarFreaks & DrumMania and beatmania IIDX series, 明鏡止水's artist is shown as TOMOSUKE feat. あさき. 明鏡止水 appears as DLC for ポップンミュージック, in the 中級インストセット pack. 明鏡止水 is one of the SET LIST Revival Songs in GuitarFreaksXG3 & DrumManiaXG3. 明鏡止水 received an EASY chart on December 12th, 2012 in pop'n music Sunny Park, replacing its old 5-Buttons chart. 明鏡止水 could be unlocked in REFLEC BEAT groovin'!! Upper as part of the 7th Set (Users' SELECTION) of the BEMANI MUSIC FOCUS unlocking system. It ranked 4th overall in number of votes of the 30 possible song choices. 明鏡止水 received a new jacket in the REFLEC BEAT series. 明鏡止水 is one of the Phase 1 unlockable songs of the Mystery Line event of beatmania IIDX 23 copula. It could be unlocked from April 27th, 2016. 明鏡止水 uses its original video from the original GuitarFreaks & DrumMania series as its video. In beatmania IIDX 24 SINOBUZ, its charts can be purchased with Kinran no omamori (金襴のお守り) from December 14th, 2016. From beatmania IIDX 25 CANNON BALLERS onwards, it is available by default. In the beatmania IIDX series, 明鏡止水's genre is kept in Japanese. 明鏡止水's title uses a different font for the song title since beatmania IIDX 24 SINOBUZ. After being removed from the initial release of REFLEC BEAT 悠久のリフレシア, 明鏡止水 was revived on April 5th, 2018. 明鏡止水 received brand-new MASTER charts in GITADORA EXCHAIN. 明鏡止水 is one of the unlocks of ノスタルジア Op.2's Minori no sato-kudamono batake- (実りの里-くだもの畑-) event. It could be unlocked from November 29th to December 19th, 2018 by collecting 126 stamps. 明鏡止水's EX chart was re-rated in pop'n music peace on March 5th, 2019. A fast, empty sound. The jazz frontier is zen. pop'n music portable 9-button HYPER chart: total notes: 1008.
pop'n music portable EX chart: total notes: 1126. EASY chart: total notes: 156. This page was last edited on 6 March 2019, at 16:45.